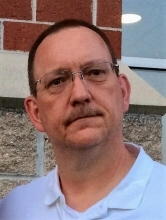 James Curtis “Jimmie” Harrald, Jr., 53, of Pleasant Hill, Missouri, was born, June 26, 1965, in Harrisonville, Missouri, the son of James C., Sr. and Mabel M. (Ott) Harrald. He was called home on Friday, November 30, 2018, at his home. Jimmie was a 1983 Pleasant Hill High School graduate. Jimmie was a United States Navy Veteran proudly serving from June 1983 to July 2003. He had been stationed at NAS Glenview, Illinois, VP-64 NAS Willow Grove, Pennsylvania, VP-92 NAS South Weymouth, Massachusetts, RAIMD and VP-66, both of NASJRB Willow Grove, Pennsylvania, and the Naval Reserve Center, Kansas City. He earned the following awards: Navy and Marine Corps Commendation Medal, Navy and Marine Corps Achievement Medal (2), Joint Meritorious Unit Award, Navy Good Conduct medal (5), National Defense Service Medal (2), Armed Forces Expeditionary Medal, Armed Forces Service Medal, Navy and Marine Corps Overseas Service Ribbon, Armed Forces Reserve Medal, Naval Reserve Medal, Navy Meritorious Unit Commendation, and Expert Pistol Marksmanship. On October 26, 1991, he was united in marriage to Georgette Ann Dietrich in Willow Grove, Pennsylvania. Jimmie enjoyed watching the Chiefs, was an avid reader, and spending time with his family. He enjoyed following Bigfoot, Alien, and conspiracy stories, as well as podcasts. He was a member of the Bigfoot Research Organization and was an active member of the Team MoKan for the Transplant Games of America. Jimmie was preceded in death by his parents and 2 half-sisters, Connie Hopkins and Martha Jane Calhoun. He is survived by his wife Georgette of the home; 3 sons that he was very proud of Kevin (and Lindsay) Harrald of Suffolk, Virginia, Joshua Harrald of Overland Park, Kansas, and Tyler Harrald of Pleasant Hill; 1 brother, Phillip (and Jean) Mann of Huntersville, North Carolina; 4 sisters, Lynn (and Dean) Linthicum, Elizabeth (and Ray) Hall, Cheryl (and Sam) Younce, and Debra Nicholls, all of Pleasant Hill; numerous nieces and nephews; other relatives and friends. Visitation was held Wednesday, December 5, 2018, at the Stanley-Dickey Funeral Home, Pleasant Hill, Missouri. Funeral services were held Thursday, December 6, 2018, at the funeral home. Reverend David Owsley will officiate. Graveside Military services and interment will follow at the Pleasant Hill Cemetery, with full military honors by the United States Navy. Casket bearers are Steve Curtis, Amanda Fisk, Kevin Fisk, Pat Guyer, Ray Hall, Keri Harms, D. J. Linthicum, and A. J. Nicholls. In lieu of flowers, the family asks that donations be made to Team MO-KAN at teammokan.org or Cancer Action at www.canceractionkc.org. Contributions may also be left in care of the funeral home. To plant a tree in memory of James C. Harrald, please visit our Tribute Store. "Email Address" would like to share the life celebration of James C. Harrald. Click on the "link" to go to share a favorite memory or leave a condolence message for the family.